We describe a rendering technique for creating animations of 3D shapes in a range of non-photorealistic styles based on 2D patterns that resemble hand-made drawings, prints, and paintings. Producing 3D animations of such styles presents a challenge: ensuring that the 2D patterns follow 3D motions while preserving their 2D appearance are conflicting goals. Our solution is to use texture synthesis in image space, optimizing a simple objective function that trade-off error of both 2D structure of the example pattern, and matching 3D motion. 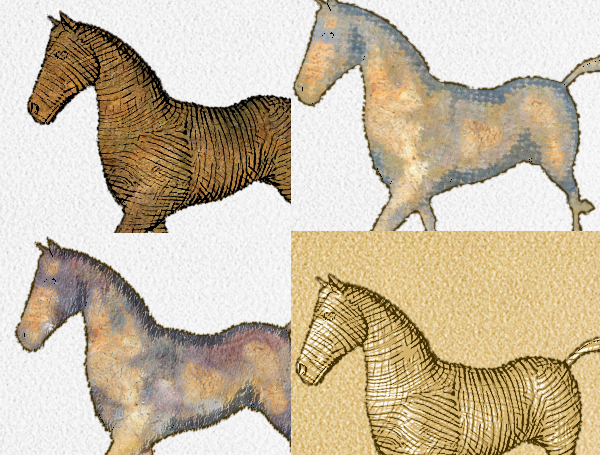 This method provides a good solution for wide variety of styles, ensures the preservation of 2D characteristics of the pattern, provides a good temporal coherence, and matches desired orientations for anisotropic patterns.